We have developed the "JUXTA VJ Series" — a new series of compact signal conditioners with two isolated outputs, which can be either plugged in or mounted to a nest on which up to 16 units can be mounted. JUXTA VJ series consists of 20 input variations as well as DC or AC power variations, of which AC-driven type produces wide ranging voltages. These variation settings have all been incorporated into a small area by using surface-mounting technology and a planar transformer. The details of the features and construction are described below. Many signal conditioners have been used on the input and output sections of large-scale distributed control systems (DCSs) for isolation purposes. Recently personal computer-based instrumentation and measurement systems have become popular and brought with them significant functional enhancements. As a result, compact low-cost signal conditioners ave been required to isolate these systems and their input and output sections. The latest development, the "JUXTA VJ Series," is a group of compact and low-cost signal conditioners with two isolated outputs, designed to meet such needs. 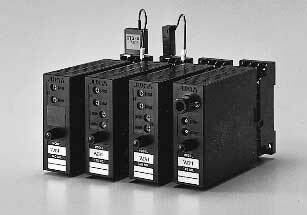 Figure 1 shows an external view of the conditioners (showing from left, a CT Transmitter, Isolator, Distributor, and P/E transmitter). Figure 2 shows the signal conditioners mounted to a dedicated mounting nest. Table 1 gives a list of the models included in this series. Remarks: Up to 16 units of the above signal conditioners can be mounted. The range of analog (or pulse) signals that can function as input signals, has greatly diversified. Twenty different models of the signal conditioners have been developed to respond to the various inputs. In addition, the various models are designed so as that they can be mounted to a nest in order to both improve the wiring of and increase the number of signal conditioners that can be mounted. Two types of power supply, high-voltage and low-voltage systems, are provided. The voltage ranges that can be used are 85 to 264 V for both DC and AC in the high-voltage system, and 12 to 36 V DC for the low-voltage system. These systems can be applied to almost all power requirements. The first and second outputs are isolated from each other and both outputs can select either current output or voltage output. The size, weight and power consumption of the present conditioners are approximately half that of the previous M series of two-output isolators (MH1D). This series of conditioners has the same types and ranges of inputs and outputs as those included on earlier series' models. These can be applied for a wide range of user applications. User applications may include a case that requires complex signal-computation processing. Linear computation processing for weir-type flowmeters, radiation thermometers, and the like is easily prepared and can be changed using the free-programming function of the universal computing unit (VJXS). The objective of the development was to incorporate two isolated outputs for many models into a small case. This was achieved by determining the shape of the case from the size of the mounting socket (as described later), and by focusing on the configuration of the printed wiring board and how to reduce power consumption. Figure 3 shows the circuit configuration of the series' typical analog signal converter, as an example. In this signal conditioner, the input section, output section, and power supply blocks are all isolated from each other. The series could be accommodated in a small case by making the circuits and components of these blocks the same for all models. The main points in the design of the package and circuits are as follows. The shape of the printed wiring board was made the same for all 20 conditioner models, and the height of the component layout restricted to 13 mm or less. The second output printed wiring board is referred to as a saddle-type module board of the main board, and thus can be freely modified. The number of components is minimized by press-fitting the hardware used for socket connection into the base and then connecting the socket directly to the printed wiring board. General-purpose relays are used in the socket in order to achieve high reliability. There are three different shaped cases: the standard type, the pneumatic-to-electric converter type, and the microprocessor mounted type. The cost of producing these cases was reduced, by replacing some of the components with molded metal parts. The input section consists of an input-processing circuit, limiter circuit, voltage/pulse-width conversion circuit and a pulse-output suppression circuit (see Figure 3). For each circuit, the circuit scheme, circuit current, component selection, and so on were reviewed to determine whether power consumption could be reduced. The input processing circuit receives signals (of DC voltages or currents, thermocouples, RTDs, slide-resistors, etc. ), ad-justs their input range widths, and then carries out linear pro-cessing if necessary. The reference junction compensation (RJC) circuit for thermocouples determines the difference between the reference voltage and a RJC sensor voltage, and effectively reduces the degree of error to its lowest level ever. The modification of the circuit current reduced the current consumption in the linear circuit by 30%. The limiter circuit limits the signal so that the voltage/pulse conversion circuit of the next block does not operate erroneously due to excess input. 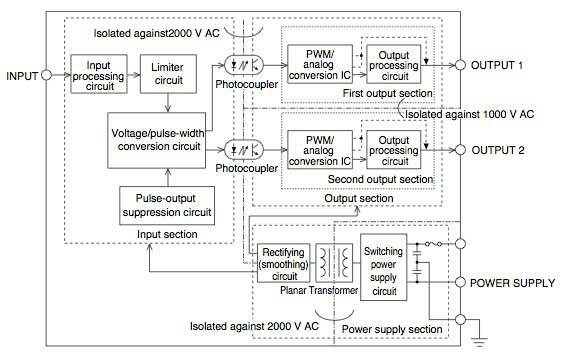 The voltage/pulse-width conversion circuit converts the voltage signal limited in the preceding block into a pulse width modulation (PWM) voltage signal. This circuit scheme prevents large amounts of static current by inputting differentiated pulses into the photocoupler, which functions as an isolated circuit. This is a very effective method for reducing power consumption. The pulse-output suppression circuit prevents malfunctioning when the power is turned on or off. 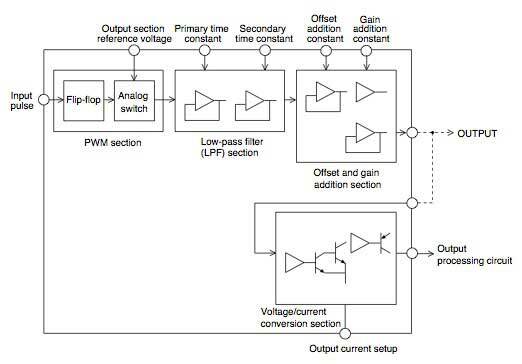 The output section consists of a PWM/analog conversion IC and an output processing circuit. 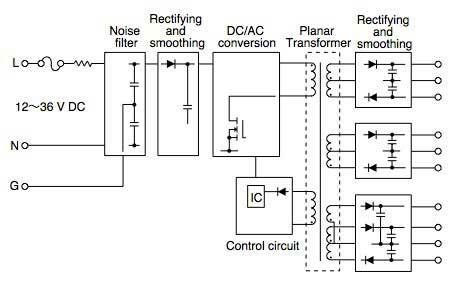 The IC used is an improved version of the conventional ASIC PWM/analog conversion ICs (manufactured by Yokogawa Electric) that are dedicated to signal converters, offering better noise immunity (see Figures 3 and 4). The improved IC enables this conditioner series to achieve a level of noise-immunity that equals and often surpasses that of earlier series even though the conditioners are smaller in size. The surface mounting area required for the PWM/analog conversion is also reduced to about 1/3. Furthermore, even if the output form of the signal conditioner changes from the voltage specification to current or vice versa, the output can be switched by selecting whether the voltage/current conversion part and the output processing circuit in an ASIC (current booster) are to be used. This achieves further space reduction by making the voltage circuit and current circuit common (as indicated by the broken line section in Figure 3), and allowing the first and second output sections to be modularized so that they can select either the voltage or current separately. Since the second output is an independent printed wiring board module, two-output specifications can be configured by adding a second output module board to the first-output specification. This setup increases production capabilities. There are two types of planar transformers developed by Yokogawa Electric for dedicated-use with signal conditioners: one for high-voltage power supply systems and the other for low-voltage power supply systems. These transformers are small and thin and their coil assemblies are formed from a combination of insulator and conductor substrates, enabling the transformer to achieve a high standard of efficiency, a high breakdown voltage and a high level of quality. The volume of these transformers is half that of the conventional PQ core-type transformers. The planar transformers have greatly contributed to making the conditioners in this series smaller. The adoption of a reduced-size input fuse, a rectifying and smoothing capacitor, and an output-smoothing capacitor, among other components, has reduced the height of the power supply board to 40% (from 20 mm to 13 mm) and the area to about 2/3 that of conventional printed wiring boards. Figure 5 shows the configuration of the high-voltage power supply circuit. In this circuit configuration, the minimum number of components was achieved by adopting an IC in which the main switch and the control circuit to be used for primary control were integrated. Through this configuration, the power supply circuit was simplified and made applicable to a wider range of power inputs. Figure 6 shows the configuration of the low-voltage power supply circuit. In this circuit configuration, the primary control IC used in the high voltage system could not be applied. Thus, the power supply circuit for the low-voltage system was constructed by combining a control IC with a MOSFET. As a result, the number of components is greater than that in the high voltage system. 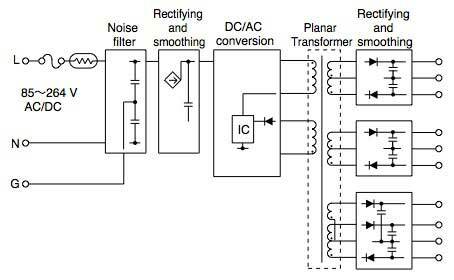 The same form of power supply modulation can be achieved by both high-voltage and low-voltage systems however, by employing surface-mountable components and using a reduced-size rush-current limiting resistor and noise filter. 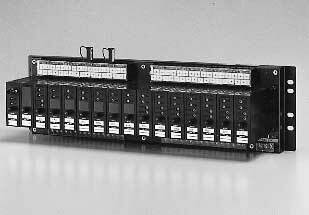 This report discusses the features and configuration of the "JUXTA VJ series of compact signal conditioners with two isolated outputs." We hope that the "JUXTA signal conditioners" are widely adopted as these additions to the VJ series offer excellent cost effectiveness.